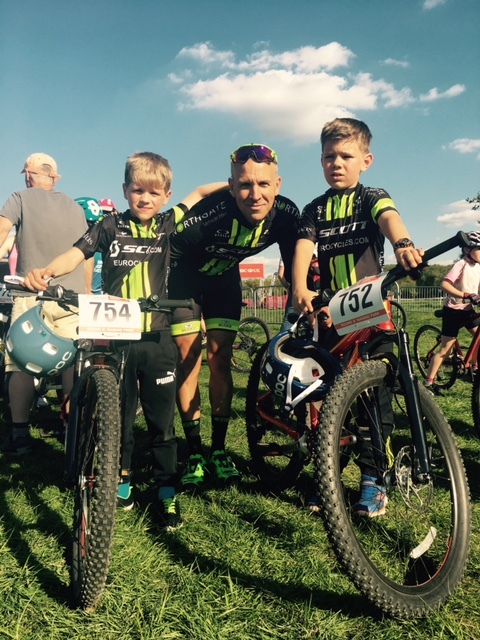 LokoCampers is cheering on Scott Eurocycles team rider DKS through the ups and downs of the UK MTB National Cross Country Series 2017 in a VW California with his team mates and family. "Another busy weekend of practice and racing - closer to home than usual - at Wasing Park near Reading. This is a beautiful venue on a huge private estate with a varied and technical course. Three sighting/practice laps on Saturday completed, but spoiled by the news that my team mate John had a huge spill on the big drop at ‘triple trouble’ ending up in a visit to Basingstoke A&E. He was kept in until 1am with a CAT scan required for a nasty case of concussion. At first he couldn’t remember the last 5 weeks of his life and had no idea where he was or how he got there.. scary. Even the next day he could not remember the accident or where it happened..!! The good news is he will make a full recovery - but be off the bike for a couple of weeks. Arne (752) and Freddie (754) once again stepped up for the U8 race on Saturday afternoon. Super effort from them both to finish well on a tough little course. Both of them pushed it as hard as they could. So proud of them and so nice to see the youngest children participating at these events. Sunday arrived and my race was off at 10.45am. I was gridded 29th based on my poor result in Round 1. Priority was to get a decent start and get up the field a little before the first technical sections. Easier said than done with everyone having the same objective and a fast and manic start. As the race settled I found myself in a group of 5 chasing and being chased closely behind and ahead. Only seconds separating the groups. The race was 6 laps and very much on the long side (1hr48 my finish time) but this suits me and I settled in knowing others might fade later in the race. Myself and Jamie Norfolk (ex-Giant Helly Hansen pro teammate of my mate Robin Seymour) found ourselves together at lap 3 and we gradually pulled away from the group of 5. He did most of the work and dropped me several times in the process. Somehow I managed to scramble back each time. On lap 5 we caught and passed two more riders and then pulled away to leave the two of us. I put in a push on the last lap and managed to drop Jamie in the last half of the lap and I crossed the finish line in 18th position 20-30 seconds up. At this point as one of the older Vet’s I can only judge myself by my own performance - and this was a solid ride on my part that would have placed me 15th in the Expert Race. The standard is once again higher this year than last. I’m sure the ride would have got me a top 12 in 2016. Racing at Gorrick this weekend and then Battle in the Bowl CX Endurance Race the week after. NPS 3 is at Aske, Richmond, North Yorkshire in 3 weeks."